I have very fond memories of tasting gelato on my trip to Italy way back when, but my first taste of gelato didn’t happen in Italy; it was actually in Bogota, Colombia. Centro Andino was a pretty new shopping center when I lived in Bogota in the early 90s, and they had a gelateria that drew me in every time I visited the center. I always ordered the dark chocolate gelato with whole almonds because the chocolate was so rich and almonds were my favorite nuts. 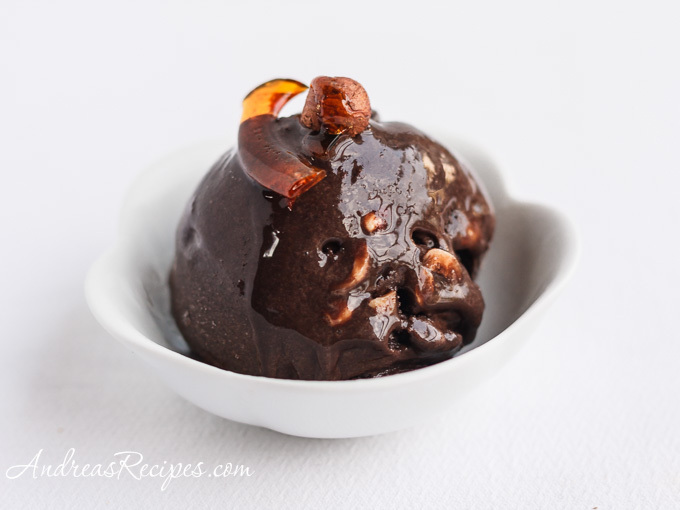 I don’t fully trust my memory of the taste of that gelato, after all it was 15 years ago, so I haven’t tried to recreate it, but I have been in search of a dark chocolate gelato that would satisfy my cravings. Epicurious had a recipe for chocolate gelato from the Hotel Cipriani in Venice that seemed promising. The recipe starts with caramelizing sugar, a twist that got my attention, and has both cocoa powder and bittersweet chocolate. I was a bit disturbed by the amount of cocoa powder listed, a whole cup in addition to the bittersweet chocolate, and some of the comments confirmed my suspicions. I reduced the cocoa powder to 1/4 cup, and we were very pleased with the result. The gelato is deep, rich, and sweet, one of those desserts that can satisfy a chocolate craving with just a small scoop. I toasted some hazelnuts to mix in and made hazelnut praline to top it off, a useful skill I learned in the Daring Bakers. Some stores carry blanched skinned hazelnuts, which will save you a little work, but if you can’t find the skinless kind you can skin the nuts at home. Skinning hazelnuts is one of those things that I don’t get too worked up about. I’ve always roasted then rubbed the hot nuts in a towel to loosen the skins, but as you can see I’m not particularly successful with it. As long as loose pieces of skin aren’t floating around in the ice cream, I’m happy. If you have never caramelized sugar, you’ll find it’s pretty easy but demands attention. You can’t walk away from hot sugar and leave it unless you really don’t mind cleaning burned sugar off a pan. It can burn quickly, so stay nearby and keep an eye on the sugar color. The dry method (melting sugar over heat without any liquid) is a standard method but can result in crystallization. You can add 1 tablespoon of corn syrup, which will help prevent crystals from forming. Gelato recipe adapted from Epicurious. 4. In the bowl of the stand mixer, beat the egg yolks with remaining 3/4 cup (131 g) sugar until thick and pale. Whisk in caramel mixture and chocolate in streams until combined. Pour custard into the 3-quart heavy saucepan and cook over moderately low heat, stirring constantly, until the candy thermometer registers 140° F/60° C. Stir and cook custard, 4 minutes more. Do not allow it to boil. Remove the pan from heat. 5. Cool the custard to room temperature, than overnight in the refrigerator. Freeze in an ice-cream maker according to manufacturers instructions. Store churned gelato in a plastic freezer container with tight-fitting lid. 7. 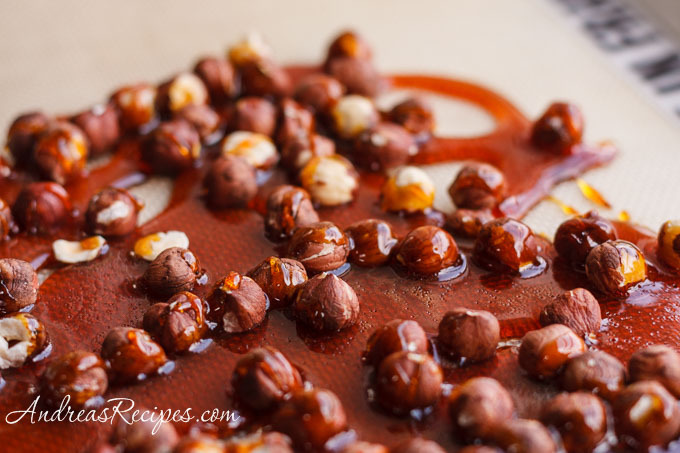 Scatter the hazelnuts onto the sheet pan lined with the silicone mat and pour the hot melted sugar over the nuts. Allow to cool completely before breaking apart the praline. 8. Serve scoops of gelato with shards of praline on top. This sounds sooo good! I have fond memories of eating too much gelato in the height of Summer, in Italy too. I love the flavours, Andrea! Wow that looks amazing! I haven’t had good gelato since I vacationed in Italy, I had my first taste of gelato in Piazza Navona. I’d like to try this but I don’t have an ice cream maker. Now I have to add ice cream maker to the kitchen gadgets I need to buy list. I enjoyed to read the gelato memories and the receipt that you gave us look and sound delicious. Totally delicious, I love the praline! Gorgeous photo. Chocolate with hazelnuts is a divine combination. Thank you for the recipe. Oh goodness Andrea, this looks just AMAZING!! We’re stopped dead in our tracks. Please revive us and bring us a big bowl…..gallon of this! Your new site is just GORGEOUS as well! Thank you for all that you do. You make the blogging world a better place.